Princess Laurentien of the Netherlands is social entrepreneur, writer, strategist and dialogue facilitator. She is passionate about social innovation, intergenerational dialogue and sustainability. In 2004, she started the Reading & Writing Foundation, which has since developed into a 100-strong team working to prevent and reduce illiteracy. In 2009, she founded Missing Chapter Foundation, which facilitates dialogue between children and leaders and aims to create a society in which it is normal to engage children as equal stakeholders in decision-making. Princess Laurentien wrote several (children’s) books, including the Mr Finney-series. Petra is a student and currently Opatija's children's mayor. From a small age she is very active in the activities of Society Our Children Opatija. Petra participated in the meetings of the Children's Councils of Croatia, the Children's Forums of Croatia, on joint sessions with parliamentarians in the Croatian Parliament. She has been nominated for the Youth Adviser Network of the Office of the Ombudsperson for Children. Petra participated to several projects and events, among which the 2017 high-level conference organized by the Agency for Fundamental Human Rights of the European Union (FRA) and Eurochild in Brussels. Former successful entrepreneur and maritime traffic engineer, Ivo Dujmic, is the Opatija's mayor since 2009. Opatija has been carrying for 13 years the title of Child Friendly City. The City of Opatija invests in projects with children and for children. Opatija is an example of a local community that protects children's rights and supports children's participation. Geneviève Avenard is the Ombudsperson for children, Deputy of the Défenseur des droits (French Ombudsman) since October 2014. She has more than 30 years of experience working in public policy regarding children, childhood protection and children with disabilities, as well as 25 years of experience working for local authorities (conseils départementaux). Furthermore, she is the President of the Children’s rights committee of AOMF (Association des Ombudsmans et Médiateurs de la Francophonie) and a member of ENOC (European network of Ombudspersons for Children). Dr. Astrid Podsiadlowski is Head of Sector on Rights of the Child in the European Union Agency for Fundamental Rights. The Agency is providing evidence-based advice to decision makers on European and national level based on quantitative and qualitative fieldwork research and secondary data analyses of policies, legislation and statistics. Her areas of expertise include child-friendly justice, child participation, child poverty, discrimination and social inequalities (multiple discrimination, ageing, ethnicity and national origin, gender and LGBTI), migration and integration and research methodologies (both quantitative and qualitative, including fieldwork research with and for children). She is a social and cross-cultural psychologist by education and has previously held academic research and teaching positions in Europe (Germany, Austria, the Netherlands) as well as New Zealand and the USA. Valentina Otmacic has been the Head of the UNICEF Office in Croatia since 2014. She has been active in the broader field of human rights, including child rights, from 1993, when she first joined an international organization assisting refugees and persons displaced by the war in the former Yugoslavia. Since then, Valentina has been working in Tanzania, Burundi, Lebanon, DRC Congo and Colombia, in addition to Croatia and Bosnia-Herzegovina. Valentina holds a Ph.D. in Peace Studies from the University of Bradford (United Kingdom). Prior to obtaining her M.A. in Conflict resolution by the Open University of Catalunya (Barcelona, Spain) and her M.A. in Culture of Peace, Conflict, Education and Human rights at the University of Granada (Spain), she graduated in French and Spanish languages and literature from the Faculty of Humanities and Social Sciences of the University of Zagreb, Croatia. Valentina is a passionate advocate of children’s participation in all spheres of life. As such, she is also a member of national Advisory Board on Children’s Participation, launched in Croatia in May 2018. 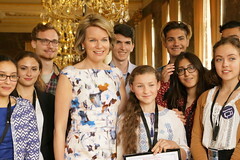 Tymon, from Poland, was one the finalists of the 2017 International Children's Peace Prize. According to Tymon, too many decisions about children are taken by adults and children are not heard. Tymon successfully campaigned to make it easier for children to participate in legal processes and access information, especially when it concerns their own lives. Thanks to his important work, Polish minors can now attend legal proceedings and represent themselves in court. Fahima, from the Netherlands, was one the finalists of the 2017 International Children's Peace Prize. She is a devoted advocate for the improvement of living conditions for children in shelters. She has contributed to a recent ruling by Dutch parliament that children must henceforth be treated as independent clients. Care previously focused on the parents who brought children along to shelters. A mechanical engineer by training he graduated at the Faculty of Engineering in Rijeka. He is a former successful basket-ball player and for the past 28 years he has been active in politics. In the late 1990s he was a representative of the Social Democratic Party (SDP) in the Chamber of Counties within the Croatian Parliament – Sabor. At that time he was also a member of the Economy and finance Committee as well as of the Domestic policy and local self-government Committee. He was the first President of the Croatian County Association. Through the regional cooperation with the neighbouring Italian regions he integrated the Primorje-Gorski Kotar County in Europe well before 2013 when Croatia officially became a fully-fledged member of the European Union. He was awarded the Solidarity star a medal of the Italian President Carlo Azeglio Ciampi, with the honourable title Commendatore. As a member of the Board of directors of the Centre for work and production activities of the disabled persons in Rijeka he participated in numerous activities of the Centre. His political obligations as the vice-president of SDP of many years did not distance him from his profession nor from sports – he is a member of the Croatian chamber of architects and civil engineers and he was a member of the Board of the Basketball club „Kvarner osiguranje“ and a long-term member of the first team in the Basketball club „Kantrida“. He is a President of the first County in Croatia that has gained the status of a Child-friendly County taking into account the need to designate a special department dealing with child and young people issues within the County organisation structure. He is married to his wife Branka and has two children – Sanja and Luka. Dr Cath Larkins is Director of the Centre for Children’s and Young People’s Participation, University of Central Lancashire. She facilitates co-research with children and young people across Europe focussed on enabling marginalised children to improve services, polices and practice. She writes on citizenship theory, participation and power, she coordinates the European Sociological Association Childhood Network and she advises governments, NGOs and academics on approaches to inclusive and impactful participatory practice. Ivana Jedud Boric is social pedagogue and associate professor in the Faculty of Education and Rehabilitation Sciences in the University of Zagreb. Ivana is actively involved in various programmes and interventions for children and youth such as mentoring programmes, education on child’ rights and social skills training. Ivana currently focuses on child participation through research, education, consultation and advocacy. The Eurochild Conference in Opatija will bring positive examples of how public decision-makers at local, national and European levels are respecting the right of children to participate in decisions affecting them. The Eurochild conference will bring together practitioners, researchers, civil society actors, policy and decision makers along with children and young people themselves to contribute to improving children’s participation in public decision-making. What to expect at the Eurochild conference? High level speakers offering inspiration and food for thought on how children can become active agents in influencing and improving public decision-making! 1/3 of the participants will be under 18 years of age! The Eurochild conference is co-designed and co-delivered with children. Children will bring their own ideas and perspectives to support their engagement in public decision-making. Interaction with participants of different ages and experiences! Participants will be invited to share their stories at the Human Library and engage with each other in small ‘home’ groups! The Youth Advisory Group present the conference background paper, its objectives & messages in an interactive way involving all participants. Time for questions & discussions. Participants break into ‘home groups’ of 12 participants – a mix of children and adults – which are led by children in the Youth Advisory Group & Eurochild’s Children’s Council. The purpose is to feedback on what we learnt & to get to know one another better. UNICEF Croatia, together with a Croatian NGO offer a screening a film focused on children’s rights. Following the screening interested participants can join the Youth Advisory Group just to hang out, chill, and play games. A chance to meet local professionals, discover local services and approaches and connect the dots between policy and practice! Over 10 study visits in and around Opatija will be on offer for participants. Info below this tab. Learn from good practices of children’s participation in public decision-makers at local, national and European levels. These interactive workshops will also emphasise the inclusion of vulnerable children. Workshops will be co-facilitated with children and offer concrete recommendations for policy makers and practitioners. (Workshops in English only). Check the 'Find out more' section below for info. Participants will join small groups to share feedback from the day and interact more closely with other participants. Participants will be invited to a seated dinner at the beautiful Royal Hall. A local folk dance group will provide entertainment. At the end of the evening those still with enough energy will be invited to a disco. Become a ‘book’ (speaker) and share your story or experience. The ‘readers’ (small group of participants) will listen, question and enter into a dialogue. The Human Library concept will allow participants to discuss the specific themes raised on previous days of the conference and to enter into small group discussions connected to individual experiences and ideas. Presentation and facilitated interactive discussions involving speakers and participants on the experiences, practices, views and messages collected throughout the 3 days event. We value everyone’s experience and what they bring with them to the event. We also wish participants to all feel welcome and included. Throughout the 3 days there will be diverse ways for everybody to give their opinion, share their own experience and learnings, to have fun, and connect with other participants. Representatives of 20 children’s councils are gathering in Opatija at the time of Eurochild’s conference. Participants get to observe this annual meeting and ask questions to the young attendees on their work, how the children’s councils are organised and the topics being discussed. Meet our hosts - Society ‘Our Children’ Opatija (DND Opatija). This non-governmental organisation is designing and organising leisure time for children of preschool and elementary school age. Participants will become more familiar with the programmes and projects of the organisation to improve the quality of life of children in their local environment. During children’s week (1st week October) in Lovran there are exhibitions, dialogues and cultural activities. Children have their say in developing proposals. Participants will find out more during this study visit. During this visit at the City Hall, participants will learn about how children and young people contribute to all kinds of decision-making related to the city’s development. As future educators, students at this award-winning faculty are encouraged to be actively involved in making decisions about the courses they study. They apply these participatory models in their future work with children. Participants will try and experience examples of transferring participatory learning from professors to students and from students to children. Children’s home “Ivana Brlić Mažuranić” Lovran offers temporary accommodation for children and young people from birth until they turn 21. Participants will observe a meeting of the ‘User council’, composed of children, and see the functioning of the process in which the users partake in decision-making activities about their lives in the Home. Participants will learn how pupils of this ecological and environmentally oriented school are encouraged to be conscious about the problems of global society and become active participants of change, through different projects and activities offered during their education. Participants will be welcomed by students, teachers and the mayor of the municipality. They will learn how children participate in the school's management through the Council of Students. The visit will also offer opportunity to participate in cultural-artistic workshops and experience how the students cultivate the tradition of the region they live in. The study visit will focus on presenting Terra’s project "Be informed, be active", a program for prevention of addiction development for high school students in student dorms. Participants will get familiar with the goals, activities and program users of the project, and have the opportunity to discuss ways of involving young people in raising awareness of alcohol and other addictions. This interactive session will give an insight into what cities look like, when they’re developed with children’s voices and priorities in mind by introducing UNICEF’s Child Friendly Cities Initiative in two countries, Slovenia and Croatia. In the form of a talk show interview, young people, NGO representatives and decision-makers will reflect on how children and young people can transform their cities through participatory action. The discussion will be followed by an interactive exercise. Rights-based decision making by governments – how children and young people can make it happen! The Scottish Cabinet held its first ever meeting with children and young people in 2016. Children and young people asked for this to become an annual event and the First Minister committed to this in 2018. The Cabinet Meetings have allowed children and young people to share their experiences and views with Scottish Ministers on a range of issues including bullying, mental health, child poverty and Brexit. In turn, Ministers have committed to give feedback at future Cabinet Meetings on what steps they have taken to progress these issues and embed a child rights-based approach to their work. Generate interest and commitment amongst decision-makers, children and young people to set up similar meetings in other countries. Consulting with children on their priorities is a critical feature of the work of CYPSCs in Ireland. As a result, a series of consultation sessions with very young children on their health and well-being needs was facilitated by CYPSC in Roscommon. The sessions were conducted as part of the broader ongoing consultations that seek to engage key stakeholders concerned with the health and well-being of young children as part of public decision making processes. The consultations have informed the development of the Early Years’ Health and Wellbeing Plan by Roscommon CYPSC for its administrative area. In this workshop, we will introduce participants to the mandate for children’s participation in public decision making that informs the work of CYPSCs. We will outline our rationale for ensuring that the voices of very young children were heard in this process, and describe the consultation processes we undertook. The views and opinions of 3 ½ and 4 year old children on how their health and well-being needs can best be met by agencies and services in Roscommon, working collaboratively are presented. This will be a light hearted, fun and interactive workshop which we hope will inspire similar initiatives with very young children. Estonian Union for Child Welfare is co-organising this workshop with Estonian Youth Work Centre. The aim of the workshop is to show that participation right needs to be approached from different systematic angels, in order for it to be meaningful and sustainable (law, policy, budget, civil society, children and young people, police, school, universities, family etc.). This will be done in example of child participation assessment (CPA) Tool and it’s piloting in Estonia. The method is followed by an exciting role play method to reflect on why it would be important and useful for countries to use this tool. The role play method helps us to investigate participation from different points of view and to find out the best approaches to different stakeholders. Booklets and shorter child-friendly version of the CPA Tool will be provided to participants. An overview of the participation of children and young people in Estonia will be shared, resulting in a discussion where all the participants can discuss the participation of children and young people, feedback the adults which forms of participation they find more suitable and what are the new, innovative and non-traditional forms of participation children and young people would like to see and experience. These examples and discussions are brought out throughout the workshop to avoid formal presentations and to combine discussions with real-life examples and practices. The workshop is open for everyone and it does not require any specific knowledge and skills. Previous experience of participation would give a small advantage, but it is not required. Children and youth can do greater things than adults will ever imagine. This was the basis for Terre des hommes’ (Tdh) work in catalysing Takeover Day in Romania in 2012, an annual event that continues till this day in Romania and many other countries. More recently, many of the projects and events that Tdh is involved in attempt to integrate more radical ideas of child participation, such as the PlanZ project to harness innovation to combat violence against children, and the 2018 World Congress on Justice for Children. Using an interactive methodology inspired by forum theatre, this workshop will aim to present and share some promising practices and reflections from Tdh’s initiatives in child and youth participation, including the philosophy and roots of Takeover Day; how new technologies impact on participation; safeguarding considerations for children in vulnerable circumstances; and ethics in an era of online data protection legislation. The workshop will also ask probing questions about assumptions that we have when designing and implementing this work, including about inclusion and innovation. The audience will be invited to engage critically with the discussion to share insights and examples from their own experience. As an output, the session will aim to bring together a set of ‘takeaway’ questions that can be used to guide young people and practitioners when planning and rolling out the next generation of participation initiatives in protection and justice programmes. The City of Hameenlinna is co-organizing this workshop with the Central Union for Child Welfare in Finland. This workshop will focus on child budgeting, which means examining a budget and child impact assessment from the perspective of children’s rights. It will include presentations and group work, introducing key terminology, different aspects and methodologies of child budgeting. The Youth advocates from the children and youth counsel of city of Hämeenlinna will present their roadmap of children’s and youth`s participation possibilities in policy decision-making processes. During the group-work the participants will have a chance to use the roadmap as a tool to evaluate the children’s/youth’s possibility to participate and make a difference in decision-making processes in their own country. The Prepare for Leaving Care training has been developed and is being delivered as part of a cross-border project co-funded by the by the EU’s Rights, Equality and Citizenship Programme. The project seeks to build the capacity of professionals to be able to care well for, and realise, the rights of young people in transition from the care system. One of the core strengths of the project and of the training is the participation and involvement of care-experienced young people in all activities. The workshop aims to share results from the project and to introduce participants to the training contents and method of co-delivering such trainings with care-experienced young people. Participants will hear about what care-experienced young people say about the challenges and gaps faced during their journey transitioning out of the care system. Participants will take away a good example of full and meaningful youth (service users) participation. They will themselves get to experience how powerful training sessions involving care-experienced young people as co-trainers are, and try one of the tools from the training. Be.Active! Empowering a Digital Generation! GSMA - Global association of mobile operators contributes this workshop in collaboration with UNICEF. This workshop on digital youth participation will focus on how the web and digital tools can be harnessed to take action and build digital communities which amplify youth voices, helping children and young people's views to be heard and reflected in the policymaking process. Adult participants will better understand how they can support children in actively and safely navigating their online environment to become informed and empowered digital citizens and change makers. Children will feel empowered to use the internet to research and engage with issues that they care about, and – if they wish – to make their voices heard. Input from the adults and children attending the workshop will feed into a joint UNICEF /GSMA document which will seek to promote understanding amongst key stakeholders, including policymakers themselves, of how to use connectivity better to seek out children’s perspectives and use these insights to inform policy. ‘The Young Journalists’ project (Migratory Birds Newspaper-Dandelion web radio) brings together adolescent boys and girls (aged 14-18 years old) from different nationalities to produce a multi-lingual newspaper (Farsi, Arabic, Urdu, English and Greek) and a web radio program (Farsi, Arabic, Urdu and Greek). The project aims to introduce refugee, migrant and Greek adolescent boys and girls to the principles of journalism and to give them an opportunity to tell their stories and promote inter-cultural dialogue. During the Eurochild Conference, a part of the upcoming issue of the Migratory Birds newspaper will be produced by the Young Journalists. The Young Journalists, in cooperation with all workshop’s participants will also cover the Eurochild Conference 2018, create peer-to-peer outcomes, and broadcast through the Network for Children’s Rights channel on YouTube as well as on the European School Radio platform. Through this workshop we will share our award-winning methodology of undertaking co-led disabled young people’s research to produce evidence, which can then be used to influence decision-making processes. - what rights do all children have, and how can you make sure that specifically disabled children’s rights to participation are met. - what additional barriers to participation do disabled children face, and how does the social model of disability help us to break down barriers. - what do all young children and young people need to be empowered to participate in decisions, and how can we ensure that disabled young people’s needs are met. - what ten things can we do to make disabled children’s participation happen. Through this workshop, participants will be able to see the value of disabled children and young people’s participation in decision-making and see the influence that they can have at local and national government levels. This method of involvement is flexible and fully inclusive so has applicability in all countries and contexts. The Disabled Children and Young People’s Participation Project empowers children and young people by enabling them to explore their own experiences in order to influence policy making and service delivery; making lives better for disabled children and their families across Northern Ireland. The contributors will detail examples of previous and current projects which enable children and young people with a disability to be included in meaningful influencing across Northern Ireland; including the use of individual pathway planning. There will be examples of the current peer coaching programme which aims to increase young people’s communication skills, their influencing capabilities and to improve their mental wellbeing. The contributors will share the many ways which the project works throughout Northern Ireland to seek the views and enable young people to exercise their right to have their say into issues that impact on their lives. The workshop will be co-delivered with young people; who will share their own examples of the barriers they have faced growing up in Northern Ireland with a disability and how they have been able to overcome some of these barriers by being involved in influencing policy and decision makers. The young people will give personal examples of how the project challenges services and policy and their 10 tips on how to make services more inclusive for children and young people living with a disability. We enrich decisions and public debate by enabling children to have a say in them as well and by ensuring that adults are accountable to the children about what actually happens with their ideas. Missing Chapter helps adults to discuss their strategic issues with children. The children get to the heart of the matter and discover that there is a point to having your say, while the adults learn to let go and be receptive to new ways of thinking and new solutions. We also publish the children's ideas as widely as possible to get the whole of the Netherlands supporting the idea of child-inclusion. We work together with five municipalities (Breda, Deventer, Groningen, The Hague and Leiden) that established a Kids Council. This is a pilot project in which children advise municipal councils on their policies to tackle poverty. During the pilot, each of the five cities is also investigating how its municipal council can best go about establishing its own Kids Council to come up with innovative solutions for social questions, such as poverty. We are currently working to create a national network, with the aim of having a Kids Council in at least one municipality in each of the 12 provinces. We found out what form a Kids Council should have when working with a municipal council, which approach produced the most worthwhile results, and which networks could be a good choice as cooperative partners. Retrieve information interactively from the participants and start a dialogue. How can we make the inclusion of children in the decision-making process the new norm? How do we stop poverty? What are the lessons learned? The iCAM Network organises this workshop with its UK, Romanian, Spanish and Italian partners. This workshop will encourage young people and adults together to explore and refine the practical solutions which the European programme ‘Including Children Affected by Migration‘ (ICAM) has developed to support the better inclusion in schools of the approximately 26 million European children who have been affected by migration. These children may be asylum seekers, refugees, or economic migrants and, because they face similar trauma from separation and disruption, the iCAM project includes the children of European migrant workers left behind in their country of birth. The ICAM programme has been successfully developed and trialled in 50 schools in Spain, Italy, Romania and Britain and is available for all schools Europe wide from January 2019. During the workshop a video of Children Affected by Migration talking and a presentation describing ICAM will prepare participants for sharing thoughts and ideas. The workshop will describe and discuss how all members of a school community can be encouraged to work together, firstly to create a climate of convivencia (living in harmony). Secondly, how to achieve the whole school development of Social and Emotional Learning (SEL) in order to help repair some of the damage many children have suffered as a result of the separation and loss caused by the upheaval to their lives when they migrate. And thirdly, how to engage with families through the ICAM family education training programme and the Social and Emotional Learning family materials for use in the home. The workshop will be an important opportunity to help further develop ICAM and achieve its widespread distribution to all schools in Europe. Experience Theatre: "From full time youth care to no care at all"
Netherlands Youth Institute is co-organising this workshop with Experienced Experts (ExpEx). Experience Theater will play a performance about becoming 18 years old. In The Netherlands that usually means a transition from full time youth care to no care at all. A group of young care leavers who work in youth care will share their experiences, through all kinds of creative forms like spoken words and songs. Together with our audience we will explore issues like: How independent are you when you turn 18? And what are your needs at that moment? In this workshop you'll hear and feel the true voices of young people. We will produce and create in a safe space of equivalence to get the best out of the participants. And our production surprises the audience and everyone will leave the room feeling connected and empowered. The book takes place on an online platform hosted by the European Commission, DG Employment, Social Affairs and Inclusion. The aim of this talk is to provide an overview on the research and evaluation activities undertaken by RAND Europe for the European Platform for Investing in Children (EPIC). The EPIC project, funded by the European Commission, DG Employment, Social Affairs and Inclusion, is an online platform that explores and assesses evidence on child and family policies and practice in Europe, and disseminates information on the effectiveness of these interventions. We discuss what constitutes an evidence-based practice in social policy, and how policy makers, academics and practitioners can engage with EPIC practices and the evaluation process. Child Participation in alternative care: Young people lead the way! The book takes place in France. This book gathers 4 stories on child participation in alternative care (participants can choose 1 or 2 each round). 1) National Youth Councils in SOS Children’s village France: SOS CV France has put in place since 2009 a national space on child participation: how it works, what are its missions and what are its projects. 2) Participation of children and youth in training sessions: SOS CV has been a part of european project which promote the children’s rights approach into the practices of professionals in alternative care. Child participation are at the heart of the project and child and Youth will become the trainers. 3) Child participation in sport program: how child participation in sport could help children and youth to develop self-esteem. 4) Child participation in advocacy: how can children and youth could be a resource in advocacy area and how SOS Children Villages in France would like to develop it? The book takes place in the south of Turkey near to the border with Syria. The action of the book takes place in one of the famous cities in Turkey, Gaziantep, a big producer of pistachios. During her activities Andreea worked in teams organizing discussion club and participating in relaxation activities for children and young people. They are involved in the public action team, who informs the children, uses role-playing games, uses English language and plays games together, having the principle of inclusion as a basis. The book takes place wherever you want it to be. Caroline works at the Netherlands youth Institute on many issues related to children, young people and families. She likes sharing ideas on including voices of everyone, but especially children in all the work and policies that concern them. She is also a parent with teenagers, and on that she could get a lot of advice form experienced experts. The book takes place on the implementation of the Sofia Strategy in Germany, but at the same time on exchange, cooperation and things learned from actors at the European level (such as through EU for a, the EU Fundamental Rights Agency, the Council of Europe and other NGOs). Their work areas are defined by the Council of Europe’s "Strategy for the Rights of the Child" (2016-21)”. They monitor the level of implementation of the strategy in Germany, implement projects to strengthen its implementation and at the same time accompany it with advocacy work to inform politicians about gaps and hold them accountable for a better implementation. - Child-friendly justice/access to justice (e.g. advocacy work for child rights in the German constitution, conference on child-friendly judicial and administrative proceedings) - Child participation in line with the Child participation assessment tool (e.g. child participation in the state report on the implementation of the CRC, analysis of children’s parliaments at municipal level, new project for 2019 analysis of existing institutions where children can bring complaints) - Non-discrimination/Equal opportunities with a focus on migrant and refugee children. - Child rights in the digital environment. (e.g. Personal rights of children in social media – Study and survey as well as awareness campaign, in 2019 a focus will be on the EU-General Data Protection Regulation). The book takes place in Reykjavik, Iceland. The leisure centre Dalheimar has for the past two and a half years worked closely with UNICEF in Iceland, the neighbouring school and teen club, parents, children and employees towards empowering children and youth. They have incorporated the United Nations Convention on the Right of the Child into almost all aspects of their work. The project is international and managed by UNICEF. They have now been recognised by UNICEF in Iceland as a Rights Respecting leisure centre - the first in the world! The book takes place in the Charter of the United Nations as a specification of the Universal Declaration of Human Rights. Every child has the right to survival, protection and education. The United Nation Convention on the Rights of the Child is a legally-binding International agreement setting out the civil, political, economic and cultural rights of every child, regardless of their race, religion or abilities. The Convention consists of 54 articles that set out children’s rights and how governments should work together to make them available to all children. Under the terms of the convention, governments are required to meet children’s basis needs and help them reach their full potential. Central to this acknowledgement that every child has basis fundamental rights. These include the right to: - Life, survival and development. - Protection from violence, abuse or neglect. - An education that enables children to fulfil their potential. - Be raised by, or have a relationship with, their parents. - Express their opinions and be listened to. Since it was adopted by the United Nations in November 1989, 200 + countries have signed up to the Convention. All countries that sign up to the Convention are bound by international law to ensure it is implemented. This is monitored by the Committee on the Rights of the Child. The book takes place in Budapest, Hungary. At Parents’ Houses, pedagogues of special psychological and sociological education are employed. With this expertise they are able to build trust relationships with families; recognise and handle upcoming problems and issues in parenting and family relationships; facilitate a community and help to keep connection to make sure real integration actually happens. The business model is a special cooperation including the venture (70-80% of revenues), the local government, the state (support and tenders) and the business sector (CSR-based cooperation). Author: Mirela Bukovac, Secretary/Croatian Association for spina bifida and hydrocephalus, bac. The book is about growing up with disabilities in small village in north of Croatia, where people never face the young people with her disability, and fighting against prejudice to people with disabilities. It’s all time struggle with people’s point of view that they feel sorry for her parents to have her, and their way of thinking that she won’t succeed and become independent. Now the pages in her book has merrier connotation than in the past, and she is looking forward to write out the best pages in her book. The book takes place in a creative space; the space which started it all. A garden in which the voice of a child is given appropriate significance. The book is about the journey of a shy 11-year-old who found her voice and was taught to use it. It is the story of a supportive group of people who helped this girl flourish and blossom into the person she really is. It is a reminder to the world that making a difference is not impossible. The book takes place mainly in North Rhine-Westfalia, the most populated German state – and parts of it in Berlin. As many other organisations, the Bertelsmann Foundation engages in projects to combat child poverty – and demands more “child-oriented” policies. However, as they all are adults, they cannot really know what “childoriented” means if they don’t include young people as experts in our work. This is why they established a Youth Experts Team. These 18 young people (age 14-21) from different social backgrounds have become a real asset in designing policy recommendations and bringing them to the attention of other young people but also the public at large. The book takes place in Flanders, Belgium. The Children’s Rights Knowledge Centre is developing a reflection tool on participation of children and young people. The tool is a working instrument for policymakers and offers them a starting point to design, run through or evaluate a participatory process. It encourages and guides them in evaluating the implicit assumptions (‘childhood images’) about youth and children that govern their actions for involving this group in decision-making processes. Based on the content of the reflection tool they will explore the possibilities, pitfalls and boundaries in creating a strategy for (effective) participation. The book takes place in the offices of the Ombudsman for Children in Zagreb, Osijek, Rijeka, and Split and in the Little House of Children’s Rights in Zagreb. It also takes place in many other places throughout Croatia where the Ombudsman for Children and her staff meet with children. This book is not about a magic wand that can remove all injustices and afflictions that happen to children and make all wishes come true with one move by achieving children's rights. It tells us that we have to go for without a magic wand and that adults have to invest a lot of efforts and will to improve children’s rights. This is where the character from this book comes in - the Ombudsman for Children, who monitors the realisation of children’s rights and proposes what to do to improve the situation of children’s rights: in families, in educational, health, social welfare, and judiciary system and other areas of life. In this monitoring process, she is assisted with information, complaints and proposals sent by parents and from children, people who work with children, experts, and others. Based on this information, the Ombudsman for Children proposes to the competent governmental representatives how to improve laws and other regulations, protection, conditions and treatment of children. That is why it is very important for the Ombudsman for Children to keep in touch with children and to hear their opinions. How does the Ombudsman help children? Most often by talking to them and their parents or carers about their problems and situations when someone has violated their rights. She also tries to find out from other institutions or experts more about the problems and the possibilities to help the child. The Ombudsman for Children cannot solve all these problems alone, but can ask those who have been obliged to protect the child what they have done to help the child, encourage them and suggest what else they can do to protect the child's rights. - Become acquainted with your rights and seek help from adults in exercising your rights! - Don’t forget that one of your important rights is the right to expresses your opinion in all situations related to you, and adults are required to consider your opinion seriously and take it into account when deciding. This doesn’t mean that it will always be the way children want it, because adults are responsible for children, and when making decisions they must protect their best interests, but children have the right to say what they think about it. - Ask the adults you trust to help you learn how to clearly say your opinion and stand for your rights and the rights of all children. The book takes place in Brussels and in Anna’s and Edvina’s home countries (Greece and Slovenia). The book takes place in Afghanistan and Sweden. The book is about two siblings, one 10-year-old and one 11-year-old coming as unaccompanied children to Sweden. The foster cares, learning the language, getting friends, being bullied etc. with an enormous drive and big ambitions. The book takes place in Naranjoven Youth Centre – a social project of Don Bosco Social Platforms (Plataformas Sociales Salesianas – Pinardi). This centre is located in Fuenlabrada, a city in the outskirts of Madrid. The project, Toma Las Riendas, focuses on promoting empowerment and participation in young people who come from very disadvantaged background or processes. In the project the process is carried out so that they acquire competences as agents of change between equals. It is carried out in teams of one educator and two young people, through on-line training, several face-to-face meetings and the sharing of action experiences in their local environments. All along the project puts at the centre young people and emotional educational and intelligence. The book takes place in County Mayo, Ireland. Comhairle na nÓg Maigh Eo is currently one of the biggest Comhairle in Ireland with over 40 representatives from all around the county and different backgrounds. The book takes place in Macedonia and in Germany. The book is about a young guy who is forced to leave his homeland with his family in order to seek a better life in Germany. After a period of time he returns back to his homeland, this time with a different perspective and priorities. He wants to continue with his education, but the country doesn’t allow him due to its procedures. The book describes the hard times that the boy encounters and how education is necessary for a young boy like him. It also demonstrates how the challenges of a system and lack of opportunities in a country can impact children from developing their skills and achieving their dreams. The book is about the task force consisting about 50 young people who have suffered from adverse childhood experiences first hand. These young people organise special workshops (e.g. for divorce counsellors), share their experiences at conferences, advise policymakers and politicians and conduct youth surveys. As a result, the Augeo Youth Taskforce ensures that young people with hands-on experience are increasingly seen and heard in initiatives to address violence against children by Augeo in 2013. Author: Konstantinos, Teens4greece Founder, Member of Eurochild Children’s Council and Human rights defender, Greece. This book describes the steps someone should follow to become a human rights defender. From Konstantinos’s experience in the UN he realised that many people feel scared to express their ideas and thoughts. In a world were human rights are constantly violated it is now the time to raise our voice. He hears stories about two different worlds. A western world in which we discuss involving children in decision making and a world in which children were denied their basic rights such as education. To solve these problems, we need contributions from everyone and more specifically young people. At the end, either we will heal now as humanity or we will die as individuals in silence. Author: Sedin, Hope and Homes for Children, Bosnia and Herzegovina. The majority of the book takes place in Zenica. The book is about the challenges Sedin went through as an orphan, which include the friendships that he made, memories he collected and life lessons he learned. The book takes place in Hungary. More information about the Human Library here. Who’s involved in the Eurochild Conference? Apart from our host and partnering host, there are many people involved in preparing a unique conference that brings together children, professionals, policy makers and politicians! We invite you to discover the breadth of expertise, talent and commitment we have received for the Eurochild Conference! Society "Our Children" Opatija is a non-governmental, not-for-profit, voluntary organisation which promotes the realisation of children's rights in society, encourages and maintains interest in freely chosen activities of preschool and school-aged children in their free time, and helps in shaping the democratic and humanistic behaviour of children. The City of Opatija received an honorary title ''City of Opatija- Child Friendly City'', alongside 5 other communities in Croatia in 2005. Initiated in 1999, the initiative of ‘Child friendly cities and Municipalities’ focuses on children up to the age of 15 years. With this title, the City of Opatija has voluntarily pledged to take care of its youngest citizens and take their views into account. The City of Opatija works together with associations, schools, social care institutions, health institutions, media and other relevant actors to develop the city based on the needs of children in Opatija. Society ‘Our Children’ Opatija has partnered with the city to offer various educational and leisure services to children of all backgrounds. Opatija lies at the centre of the Croatian riviera. Its geographic position, enabling its warm seas to be quickly reached from many cities in Central Europe, the lush green scenery and a pleasant climate, were some of the main reasons why it became a popular tourist destination since the 19th century. Well-maintained public gardens, the 10-km-long coastal promenade known as the "Lungomare", provide a stunning backdrop for the conference. Opatija's ideal position at the juncture between sea and mountains in the mainland is also reflected in its gastronomy. The youth advisory group involves 10 young people (below 18 years) from 8 European countries, selected from Eurochild member organisations. They have a key role in contributing to the overall development and delivery of the conference. Eurochild’s child participation reference group includes NGO and academic members with expertise in child participation and has been set up to support the implementation of Eurochild’s Child Participation Strategy, which includes providing advice on how to embed children’s participation into the Eurochild conference. The programme advisory group was set up in Croatia by the host organisation. It includes Croatian academics, representatives of civil society organisations and the Ombudsperson for children. The group advises on the programme of the conference, including study visits and ensures a link with key Croatian children’s rights policy developments. How can governments offer the best space for children to engage in public decision-making? Want to support our Conference? Associate your organisation with the conference and support the work that is being done in the child rights sector, connect with European civil society and gain visibility by engaging with a diverse public of 300 participants from across Europe. Find out more! What does children's participation look like in practice? Children of Opatija welcome you! Meet Max and Laura, Eurochild mascots!